We’ve had snow and cold, yet this perennial container that was planted up in the spring is still going strong. Mark Yadon of Mischler’s Florist and Greenhouses, 118 South Forest Rd., Williamsville, designed this creation called “Winter Green.” He planted it up as a demonstration at the Lewiston GardenFest in the third week of June this year. As we told you in September, there are two tricks to this planter. First, Yadon chose perennial plants that keep their color after the first frost and well into winter. Some have green leaves, but others are yellowish or almost black. The plants have a variety of growing habits– some cascade while others are more upright. There are a variety of textures, leaf shapes and leaf sizes as well. The second trick involves the flowers. One of the plants, bergenia or pigsqueak, gets flowers in spring, but many people want flowers throughout the year. Yadon added an annual, a New Guinea impatiens, for floral interest in the summer. In the fall, that was pulled out and a mum was inserted in its place. 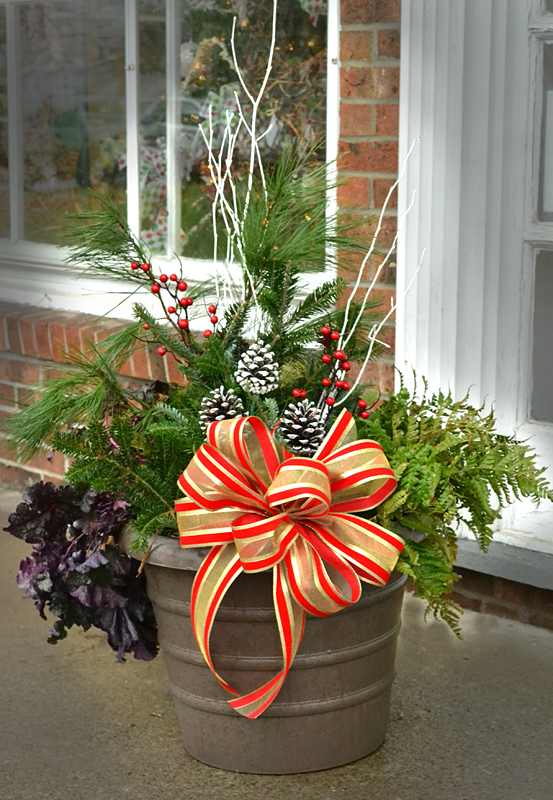 Now Christmas decorations add more color to the container. You can see why this design won a first-place prize at Cornell University’s Floriculture Field Day. While it wasn’t designed to be viewed from all sides, it does look good from the back as well, as you can see below. 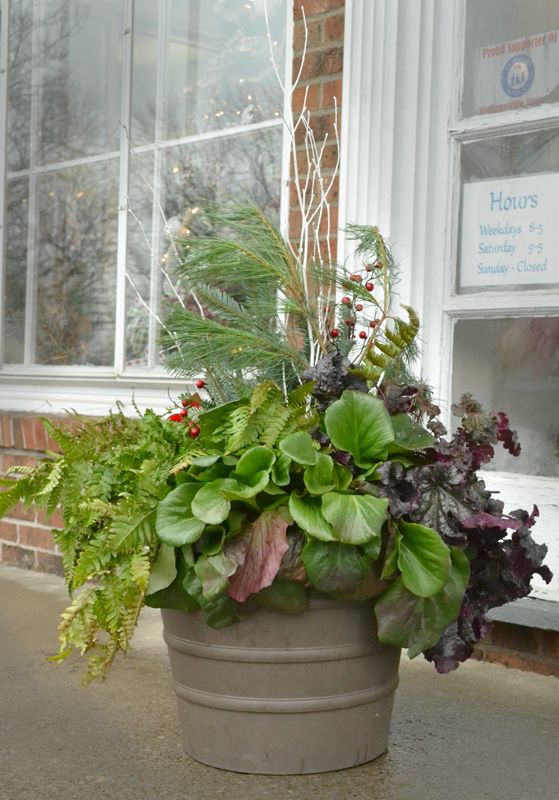 It looks so fresh it’s hard to believe this is an outdoor container in December! It’s on display near the front door. See all the instructions for caring for this planter here. Mischler’s has many varieties of poinsettias, Christmas decorations for miniature gardens, floral arrangements and many other gifts for gardeners, including gift certificates. Do you need to refrigerate daffodil, tulip bulbs before forcing them indoors?Lockwood’s last-minute gift ideas for a gardening friend– or yourself!